Duplication and grouping: The app fails to identify duplicate numbers in the contact list. If you restore contacts from the Google Drive or Dropbox, the phonebook will become a mess. The app doesn’t let users group contacts. Hence, to send messages to co-workers or friends, you’ll have to copy the numbers manually. Images: Pictures can help people in finding a contact quickly. The app lacks an option to add a photo or group contacts. It doesn’t include a search option. Hence, you won’t be able to find the contact by the name. Customization: The icons used in the app are ugly. Furthermore, the app doesn’t allow users to change the font, color of the interface. GC runs on devices powered by Android 5.0 and higher OS. It identifies duplicate entries in the phone book and displays an option to merge them. It has suggestions feature with which you can find and add the frequently dialed numbers to the contact list. GC lets users mark contacts as their favorite. GC lets you import contacts from a SIM card or a VCF file to the phone book. You can also backup or export contacts with it. GC enables you to sort the contact list by the first or last name. You can also change the way the app displays names on the list. 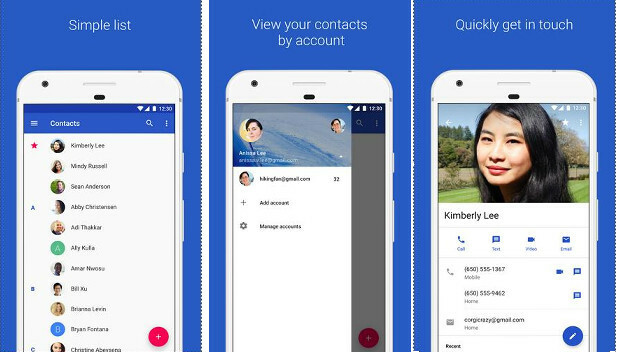 The app syncs your contacts with Google Drive. It allows you to create and assign labels to the contacts. GC has a built-in call blocker utility, but it doesn’t have a dialer. Its size is 3 megabytes. C+ is a good alternative to Google Contacts. It can find and merge duplicate entries automatically. It lets you backup the contacts and messages on the phone’s storage memory. The app provides a shortcut to make calls quickly. To make a call, users must tap the contact’s photo twice. CP allows users to add shortcuts to their favorite contacts on the home screen. Contact+ has a caller ID function. Hence, you can get details of unknown callers and block fake callers without using a third-party reverse phone number lookup app. The app enables you to search for SMS by word. It allows you to see the messages and calls received from a specific number. It has a built-in dialer and SMS blocker utility. Users can set up call reminders in the Contacts+ app. C+ has the option to change the home screen icon and the color of the user interface. It consumes 20 to 22 megabytes of storage memory. The app is compatible with Android 4.0+ operating systems. It has ads. 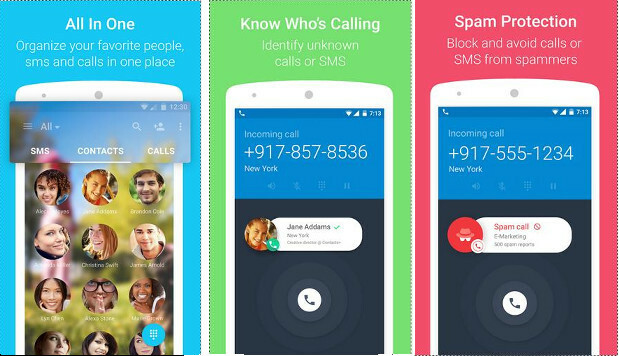 True Phone is a powerful contact manager app with a built-in T9 dialer. It allows users to customize the interface’s text size, design, theme, navigation bar, etc. It lets you change the date format, dial pad font, etc. You can configure TruePhone to hide the labels, icons, colored avatars, etc. TruePhone lets you organize and group contacts. It provides an option to restrict the call log history to 1000 items. It supports Dual SIM phones. True Phone enables you to blacklist phone numbers and contacts. It lets you create shortcuts to contact group or individual contacts on the home screen. True Phone supports 30 languages. It has filters to show only incoming, outgoing, missed or blocked calls in the call logs/history. Users can import or export contacts with True Phone. 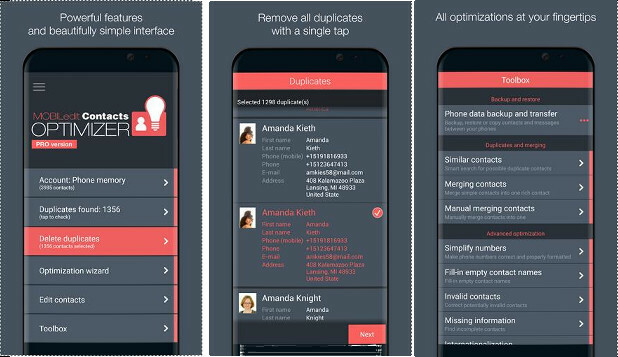 If you’re happy with the existing contact app on your phone and you’re searching for an app to eliminate duplicate or invalid numbers, backup or restore contacts, download this app. CO supports numbers with special characters. It lets you filter contacts by photos and numbers. It allows you to bulk delete birthdays, contacts, etc. The app includes a wizard utility which will scan the phonebook and recommend optimizations. It has search-replace utility and an option to move contacts from one account to another. CO enables you to manage WhatsApp contacts. It can add the country code in front of contacts and fix the capitalization errors in the phone book. CO lets you see the contacts that don’t have a name. The app doesn’t have advertisements, but it displays a popup box with a message to buy the Pro version of CO.
Drupe has 10 million users. 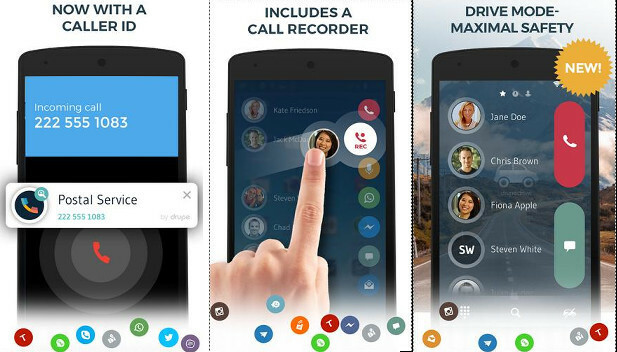 It is a top-rated contacts app that supports speed dial function and dual SIM Android phones. It ships with a powerful T9 dialer. The app provides several themes for the phonebook and dialer. Drupe includes a caller ID utility. It lets you block spam messages and fake calls. The interface of this app has a semi-transparent background. To access it, you must tap on the 3 dots displayed on the screen and swipe it to the right side. Drupe draws the phonebook over other applications. It includes a call recorder utility. It allows you to find the phone numbers of popular businesses in your area. If your friend uses Drupe, you can send GIFs to him/her. The app lets you star and reorder contacts. It runs on Android 4.1+ devices. 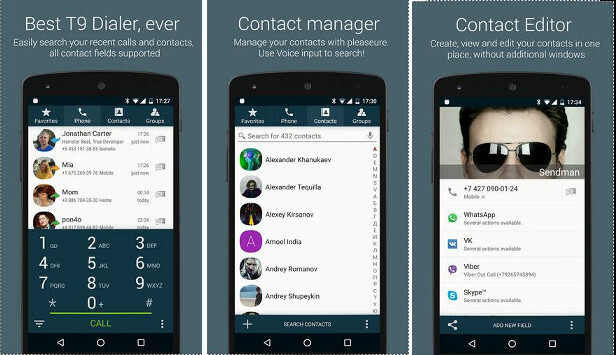 GC, True Phone, Drupe, CO, and C+ are the 5 best contacts app for Android. They have a nice customizable user-interface and many useful features. CM Security Master review: Free Android security suite with VPN	UC Browser vs Chrome: Which browser is better? First of all, why is Samsung eliminating personalization features? Seems to be going backwards? And second, are there contact apps that will allow me to better organize Contact Groups with notification tones (I really appreciated knowing if a text was work-related or family or friends! )?